Really? Eat More Butter? Yes! For years, maybe even decades, experts told us to back away from the butter. Put down that horrible, saturated, animal fat. Turns out, that advice was not necessarily the best. We now know much more about butter and other animal fats and what kind of place they can have in a healthy and well-rounded diet. If you are a health food and superfood enthusiast and you like foods that taste delicious, it’s time to take another look at butter. You may be asking right about now if butter can be a tasty ingredient in smoothies. The answer is a resounding yes. Read on to learn more. Butter is probably as old as milk itself, which humans first started gathering from domesticated livestock thousands of years ago. The oldest reference to the creamy dairy product is from a tablet dated to about 2000 B.C., but it was likely made long before that. In the early days of butter it was a specialty and an expensive product. In many cultures butter was used in religious ceremonies only. Although not so pricey today, that tradition continues in certain places like India and Tibet. In other cultures, such as ancient Rome and Greece, butter was used as a cosmetic product to make hair and skin smooth and healthy. Butter was even considered a health food back in ancient times and was credited with preventing and correcting certain eye and kidney problems. It has only been in the late 20th century that butter started to get a bad rap and that can be blamed on a misunderstanding of saturated fats. We have long been told to consume only minimal amounts of this type of fat, most often found in meat and animal products like butter. Very recently, though, the tides have turned. Newer research is showing that there is no reason to think saturated fats contribute to heart disease and we even know now they can be good for you. Butter is a dairy product made from cream that has been separated from milk. Churning fresh cream separates the butterfat from buttermilk. It’s a very simple process that involves shaking or beating the cream until the fat separates. The butter milk is filtered off and the remaining butterfat can be shaped into the product you know as butter. Modern techniques for making butter include pasteurizing, or heating, the cream before churning it to make butter. Commercially-made butter is around 80 percent fat, while simple, churned butter usually has a lower fat content. We have been taught to be suspicious of butter and to instead reach for butter substitutes, like margarine. Margarine, or oleo, and other butter substitutes are made with vegetable oils, which are supposedly better for us, but they have been treated in such a way that they are no longer healthful. To turn vegetable oils in to solid butter substitutes, some of the natural unsaturated fatty acids are turned into saturated fats and trans fats. Trans fats are known to increase the risk of heart disease, to increase levels of LDL, or bad cholesterol, in the blood, to lower the functioning of the immune system, and to increase the risk for developing diabetes. Trans fats are not the only culprits in margarine, though. Butter substitutes also contain far more omega-6 fatty acids than omega-3 fatty acids. We need both of these to be healthy, but in a certain ratio. 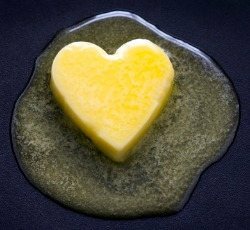 The ratio of these two fats in the vegetable oils used to make margarine is out of balance and this can lead to health problems, such as heart disease. Vitamin A. Butter is an excellent source of vitamin A. Just one ounce of butter provides 14 percent of your daily need of this important nutrient. Vitamin A is important for eye and skin health and also for the proper functioning of the thyroid gland. Butter also has significant amounts of vitamins E and K and the minerals selenium, zinc, copper, and manganese. Saturated fats. Of course we know that butter is rich in saturated fats. This is the reason that we have been long told not to eat it. Saturated fats are supposed to be bad for us and we are supposed to severely limit our intake of them. The low-fat craze is over, though, and we now know that we need these kinds of fats in our diet. The fats in butter are short- and medium-chain saturated fats. These have been shown to raise levels of HDL cholesterol, help contribute to weight loss, and lower the risk of stroke. These fats are even known to reduce tumor growth. There is no evidence that saturated fats increase the risk for heart disease. Not convinced, click here to check out my article on the importance of getting your fats right. This short-chain fatty acid is found in butter in significant amounts and may be the reason for the word butter. Butyrate helps to reduce damaging chronic inflammation throughout the body and regulates the immune system, preventing it from attacking healthy bacteria in the gut. People with Crohn’s disease and colitis can benefit from the butyrate in butter. Conjugated linoleic acid (CLA). Another important fatty acid in butter is CLA. It can actually reduce body fat in people who are overweight and following a restricted diet. It can also help the body better tolerate glucose and fight cancer cells. CLA is mostly found in butter that comes from grass-fed cattle. Joint health. Butter has been shown to protect joints against arthritis, but only when unpasteurized. The process of heating the butter during pasteurization destroys whatever factors or nutrients confer this protective effect. Gastrointestinal health. Butter contains a type of fat called glycosphingolipids. This fatty acid protects the gastrointestinal system from infections and irritation by acting on the inner, mucous membrane layer of the gut. Eating more butter can protect you from infections, diarrhea, and general stomach upset. Now you know all the wonderful reasons that you should make butter a part of your diet. Unfortunately, you can’t pick just any old butter out of the refrigerator section of your grocery store and expect to get the benefits listed here. To get all the benefits of butter, you need organic butter from grass-fed cattle, not the butter that comes from factory farms and grain-fed cattle. Butter from grass-fed cows has all the important nutrients that are good for your health. In fact, studies have found that people who eat grass-fed butter have a lower incidence of heart disease compared to those consuming grain-fed butter. So what’s the difference? Cows that are fed in a pasture as opposed to a feed lot produce dairy with up to five times the amount of CLA. Grass-fed cows also produce milk with a better ratio of omega-3 to omega-6 fatty acids. Grain-fed cows make milk with a ratio tipped toward omega-6, which is unhealthy. Grass-fed butter has more vitamins, particularly vitamin A and vitamin K2, which is responsible for helping the body use calcium and prevents plaque formation in arteries. Finding butter from a local farmer whose cows are pastured and grass-fed is ideal. If that’s not possible, Kerrygold is a good option that’s pretty widely available. There are other good brands, just do a little research to ensure they’re legit. Now you know why you should be eating more butter, but the idea of putting it in your smoothie might still seem a little strange. It may help to know that there are two main varieties of butter: salted and sweet. Salted butter is great for spreading on your toast and it will stay fresh longer. Sweet butter is simply unsalted butter and it’s best for baking or in other recipes in which you want to control the amount of salt. Sweet butter is rich, creamy, and buttery without being salty. The good news about making grass-fed sweet butter a part of your smoothies is that it works with any recipe. Butter has a natural flavor that complements other flavors. It adds a richness that goes with all other ingredients. If you use coconut oil you have an idea of what adding a tablespoon or two of fat can do for your recipe. To cover all your bases and to experiment with the differences in flavor in texture, try alternating your recipes with butter and coconut oil. Here’s one of my favorite buttery smoothie. Grass-fed butter is a wonderful superfood, but it doesn’t mean that you should eat as much as possible. This is a high-calorie food and it is rich in cholesterol, so don’t go overboard and eat cups of it every day. One to two tablespoons, especially if you are including other healthy fats in your daily diet should give you a good dose of powerful nutrients. It’s also a good idea to listen to your body. When it craves something, you probably need more of it (processed junk foods being the exception to this rule, of course). Now go enjoy your butter and better health. Do you consume ample amounts of butter and has it positively impacted your health? Please share in the comments below. 2 Responses to Why Butter is a True Superfood! When my husband was diagnosed with brain cancer and diabetes after a severe car accident three years ago, he stopped being able to eat solid foods. We were devastated, and briefly considered moving to a country where assisted suicide is legal until we discovered butter. Frank couldn’t chew solid foods anymore, but he was still able to eat butter, and eat butter he did. I still tear up at the memory of him sitting in his hospital bed with butter dripping down his cheek, a wide smile gracing his thin, malnourished face. His last words to me before the cancer took him were, “Carol, thank you for the beautiful life together, and thank you especially for the butter. I can now die knowing that I have truly lived.” Since his death, we honor him by always putting butter in our smoothies. I have found that butter goes especially well with blended kiwi. That’s quite the testament to butter, Carol. Thanks for sharing. I’ll have to try butter with kiwi sometime soon.